As we started our summer with an amazing adventure on the legendary double six it seemed rather appropriate to end it at Chillin on Beale Street with the theme of wheels on Route 66 and the debut of the exciting new book, Greetings From Route 66http://rcm.amazon.com/e/cm?t=1968adventurer&o=1&p=8&l=bpl&asins=076033885X&fc1=000000&IS2=1&lt1=_blank&m=amazon&lc1=0000FF&bc1=000000&bg1=FFFFFF&f=ifr. There were cars, music, crowds, friends, and a celebrity of two such as Bob “Boze” Bell, a former Kingman resident who has gone on to bigger and better things such as acclaim as an artist and managing editor at True West magazine. As this was also the weekend for the Mohave County Fair and a major car show on Saturday afternoon, I was quite surprised to find the event was the largest to date with cars on display filling almost three blocks and a steady stream of vehicles cruising in both directions. Garishly painted street rods and the creative manifestations of vivid imaginations in the form of rat rods dominated the evening but scattered amongst these were a wide array of vintage iron, modern classics, and even representatives from foreign manufacturers such as MG and Triumph. Bob Bell presented Jim and Gail Nichols of Colorado with a pre release copy of Greetings from Route 66 signed by Russell Olsen author of Route 66 Lost and Found, http://rcm.amazon.com/e/cm?t=1968adventurer&o=1&p=8&l=bpl&asins=0760334927&fc1=000000&IS2=1&lt1=_blank&m=amazon&lc1=0000FF&bc1=000000&bg1=FFFFFF&f=ifrand Jim Hinckley, as the grand finale. For the grand prize winners it was the end to a perfect evening. They had planned a vacation along Route 66 with a stop in Las Vegas. However, after reading about the event on the Destination Kingman page on Facebook, they adjusted their plans so they could be in Kingman on Saturday night. It would seem Destination Kingman is a very apt descriptor. Last month a family from Holland planned their journey along Route 66 to coincide with the Chillin on Beale Street festivities. Regardless of the theme, the prizes, or celebrity appearance, it is always the cars that are at center stage and this edition of Chillin on Beale Street was no exception. There were more than a few vehicles that snagged my undivided attention but there was one in particular that I would have loved to take home – a bone stock, vintage Dodge coupe that was obviously not a trailer queen. With its dings, dents, and faded paint it was not a show inner. 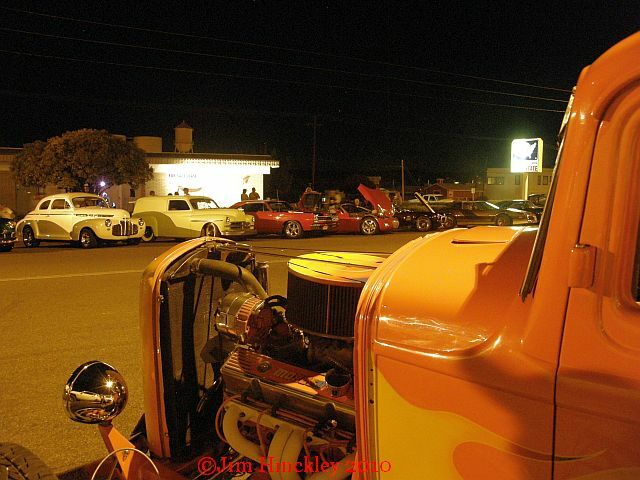 However, it was enjoyed by the owner and garnered a great deal of attention, not an easy task in a sea of street rods and antiques with flawless paint jobs. As the sun sank into the west and the shadows lengthened, the crowds filled the streets and the cruising began in earnest. A small herd of Model T Fords followed a string of late model T-Bird coupes and convertibles. In the opposite direction flowed vintage pick up trucks and jacked up off roaders. Motorcycles with their thunderous exhaust filled the gaps. After dark it was time for a parade of lights. Tuner cars with their neon tubes and vintage street rods with blue dot lenses, antiques with their dim, magneto lit lights and even Christmas lights on a vintage Chevy. What a fantastic way to close out a fantastic summer on legendary Route 66!